Donetsk Christian University falls to separatists. Staff apartments are being used to house rebel militia. Ukraine (MNN) — Pro-Russian separatists have taken over Donetsk Christian University, trapping more than 20 staff members and their families inside. 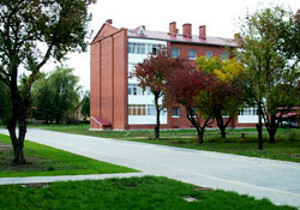 The school is one of many public buildings the separatists are occupying in a desperate attempt to solidify their hold on the city. “This place is so dear to m. It’s so close to me, and I know the people that are there,” shares Russian Ministries president Sergey Rakhuba. Until last spring, Rakhuba was a member of Donetsk Christian University’s Board of Trustees. He’s been in close contact with the school’s president about the situation. “The concern is that when the Ukrainian army sees that insurgents [have] taken over the building and turned it into their stronghold…. Ukrainian army then starts going after [it] with military action,” says Rakhuba. Taking over buildings like the Donetsk Christian University puts innocent people right in the line of fire. Along with the school, separatists have reportedly seized several businesses. Separatists appear to be “digging in their heels” and preparing for a showdown with Ukrainian government forces, who warned rebels yesterday of a plan to re-take the city. “I cannot comprehend the magnitude of that tragedy that will happen” if urban warfare breaks loose in Donetsk, Rakhuba says. It’s an urgent situation that needs your help. First of all, pray! “I want your listeners to pray for the leaders of this Bible School that are there now dealing with this crisis, so that God supernaturally would intervene and protect them all,” says Rakhuba. 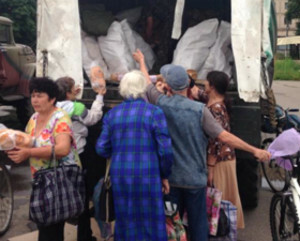 Items received through “I Care” Refugee Program distributed in eastern Ukraine. Pray that the Lord will continue to work mightily in Ukraine through Russian Ministries. Their “I Care” Refugee Assistance program helps churches in eastern Ukraine care for refugees displaced by current violence. Along with relief aid like food and personal care items, churches are equipped with counseling resources and pastoral training. Click here to put your faith into action by supporting Ukrainian believers. School Without Walls students have been sent with resources in-hand to cities that were previously occupied by pro-Russian separatists. Listen to the interview for more details on this situation. Praying for Ukraine and eastern Ukraine; that the Prince of Peace will remove this great evil unleashed in the Donetsk and Lugansk Oblasts. Praying for you that God may fill you with his love, peace and Grace, even in the midst of such trying times. Know that our God is greater than any powers of this earth. You are daily in our prayers. Unfortunately the persecution of the church is on the rise in Eastern Ukraine wherever the Russian separatists are in control. Please continue to pray for Donetsk and Lughansk! Praying with you for peace in Eastern Ukraine. I had the privilege of teaching there early in 1994 as a part of a communications program. We pray that God will keep each one safe in His gracious care. It is highly challenging to be encircled in this kind of scenario. However, God cannot abandon His flock, in Jesus name. 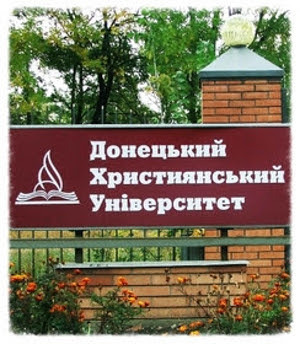 Ask the Lord to protect people who are trapped in Donetsk Christian University. Pray that the Lord will continue to work mightily in Ukraine through Russian Ministries. Pray for wisdom for Ukrainian authorities and leaders.